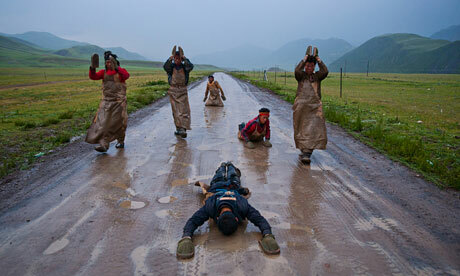 Pilgrims proceed at a snail's pace performing the Chak Tsal, the Tibetan name for ritual prostration. He arrived at a photo of several young men dressed in leather aprons and heavy mittens, with plastic covers on their shoes, making their way down an empty road high on the Tibetan plateau. One of them was lying prostrate on the ground, another rising to his feet, others walking forward. They were pilgrims making an arduous month-long journey to Lhasa. "To get this frame that's perfect, with one guy on the ground, another rising, other standing, I must have had to walk half a mile backwards," said Yamashita. "And it was raining." Later, I asked him how far he has gone to get a single shot. "I wouldn't risk my life, but it's all about getting the picture," he said. "You'll do what you have to do." Now he is one of the last remaining photojournalists from an era when photographers commanded big budgets for ambitious assignments. "I'm the last of a breed," he says. Shangri-La is one of those projects. Yamashita has been travelling to Tibet for 15 years and the photos in the book were taken over a period of five years, a length of time that was increased by travel restrictions imposed on Tibet after the 2008 riots. Now Tibet is closed once again to most outsiders. Given the rapid economic change and the government's encouragement of Han Chinese migration to the province, these may, says Yamashita, "be the last photos you'll see of a Tibet that still looks like Tibet". Like all of his projects, this one began with research. "I've read just about every book that was ever published on Tibet," says Yamashita. "We don't have time to mess around. There's nothing left to chance – we go at the right time to get the right people in the right pictures." Yamashita travelled with a Chinese fixer and a driver, starting his journey in Sichuan's Jiuzhaigou Valley, a "photographer's paradise" where Yamashita worried the mesmerising landscape of waterfalls and craggy hills might lead some viewers to think he was altering his photos. More than landscapes, though, it's the human geography that fascinates Yamashita. In Jiuzhaigou, for example, tea is grown, harvested, dried and hand-processed into bricks. "This is why I'm drawn back to Chinaagain and again – the fashion may have changed – the cities certainly have – but certain practices are exactly the same as they've been for centuries." He is also fascinated by the way certain traditions flourish against all odds. In one village, he encountered a group of Yi minority women dressed in colourful, elaborately embroidered dresses and hats. "I followed them back to their village and I couldn't believe it," says Yamashita. "I thought, this has got to be fake – who can wear that kind of clothing all the time? Their art is what they wear. They live on dirt floors and they get up every morning and put on these amazing clothes." Pressing on, the journey into Tibet was difficult. Mud roads are often washed out, and patrolled by work crews who, instead of fixing the roads, charge a fee to dig out cars and trucks. (Yamashita had to pay 900 yuan, around £90, to get his three cars liberated.) Once, while making their way through a mountain pass, Yamashita's fixer was stricken by altitude sickness and had to be hospitalised. And then there was the tea. Every day, Tibetans drink 30 to 40 cups of yak butter tea. "When your cup is empty, they'll refill it right away," says Yamashita. He tried to drink as little as possible. "They always seem to use rancid milk. It's like blue cheese with a bit of tea flavour." The stomach-churning tea was well worth it. As his journey took him higher into the Tibetan plateau, Yamashita ventured deeper into a society unlike any other. Sacred lakes are left untouched for the benefit of the gods; hills are festooned with elaborate prayer flags. 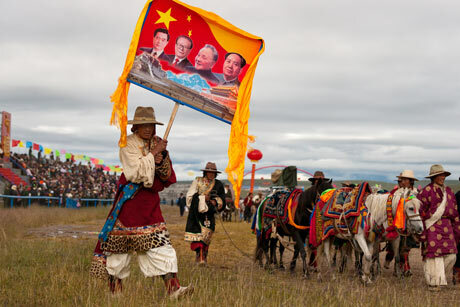 One day, he encountered a festival to mark the unification of Tibet's tribes. Tourists had yet to discover it: aside from a military patrol, he was the only non-Tibetan there. And there was more evidence of a Tibet besieged by change, but not necessarily for the better. 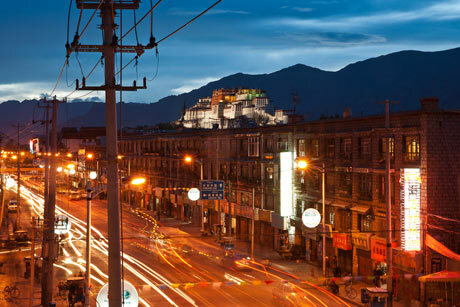 Tibetan architecture is fast being replaced by Chinese-style structures, some of them paid for by various provincial governments. Even traditional nomadic tents are giving way to standardised tents issued by the government. "The architecture shows who's in charge there," says Yamashita. Many of the changes are economic. Over the past few years, a boom in demand for yartsa gunbu – fungus-infected worm larvae sometimes called "Tibetan viagra" – has brought modern amenities to a number of Tibetan towns. But it has also erased much of their distinctiveness – "and most of the profits still go to Han Chinese," says Yamashita. Still, Yamashita himself is no stranger to change. "I always thought I'd be the last guy to shoot on film," he says, but an aerial photographyassignment forced him to switch to digital after he used his film budget to rent a helicopter. "Now I wish I had switched earlier. It's so much easier." "The future is cloudy for up-and-coming young photographers," says Yamashita. "It's almost impossible to make a living now. It's always been a 1% of 1% job – you can't learn this in school – but there's no training route now." At least Yamashita's place in the pantheon of photography is secure. He is currently wrapping up a project on China's Grand Canal, and his next stop after Hong Kong is Brunei. "I'll do some shooting there," he says, adding, with a slightly mischievous tone, "I know the sultan's son." Interesting article on photography in Tibet yet to be seen. Looking forward to look and be amazed at his work!